Motorcyclists face significant risks on the road every day. Between 2005 and 2016, approximately 5,000 motorcycle riders were killed on U.S. roadways each year, accounting for 10 to 14 percent of all traffic fatalities. That’s especially sobering when you consider that motorcycles make up only about 3% of registered vehicles in the United States and account for less than 1% of miles traveled. The National Highway Traffic Safety Association (NHTSA) says a motorcyclist is six times as likely to be injured in traffic and 29 times as likely to die in a crash as the occupant of a car. Between 2006 and 2015, the number of motorcycles registered in the United States increased by more than 28%, from just over 6.6 million to more than 8.6 million. Those numbers continue to climb, due in part to increasing interest among baby boomers. Unfortunately, the growing popularity of motorcycles has been accompanied by a 17% increase in motorcycle accident fatalities among riders aged 40 and older. If you or a loved one has been involved in a motorcycle accident, contact a motorcycle crash lawyer as soon as possible. Despite the increase in the number of motorcycles on the road and the increasing death toll among middle-aged riders, the total number of motorcycle injuries and fatalities has remained fairly stable over the past ten years. Nearly ¾ of two-vehicle crashes involving motorcycles are frontal collisions. The most common cause is another vehicle turning into the path of a motorcycle, not allowing the motorcyclist time or space to avoid the collision. In fact, more than 40% of fatal crashes involving a motorcycle and another type of vehicle occur when the other vehicle is turning left. However, many motorcycle fatalities are the result of single-vehicle accidents in which the motorcycle collides with a fixed object. Surprisingly, just 2% of motorcycle fatalities occur in the rain, and most occur during daylight hours and on non-interstate roads. In other words, weather and road conditions are not often a significant contributing factor. Motorcyclists involved in fatal accidents are more likely to be impaired by alcohol than drivers of cars, trucks, or other vehicles. More than ¼ of motorcycle riders killed in traffic are above the legal limit of .08 BAC, and another 7% have some alcohol in their systems. In addition, 1/3 of all motorcyclists involved in fatal crashes are exceeding the speed limit. 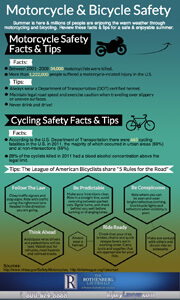 Motorcyclists are more vulnerable than drivers or passengers in cars, trucks, vans, or other enclosed vehicles. As such, it is imperative that riders take extra precautions on the road, including remaining alert, observing traffic laws, allowing adequate distance between themselves and other vehicles, and refraining from driving under the influence. If you or someone you love does become involved in a motorcycle accident that results in injury, however, it is important to contact a motorcycle personal injury attorney to determine if you are eligible for compensation. 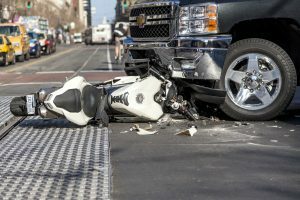 If you have been seriously injured in a motorcycle accident or have lost a loved one in a motor vehicle crash involving a motorcycle, your next step should be to talk with an experienced motorcycle crash lawyer. The process of pursuing compensation for your motorcycle accident injuries or the wrongful death of a loved one is complicated, and strict deadlines apply. You owe it to yourself and your family to protect your right to compensation and enlist the help of a professional motorcycle injury lawyer. Getting the guidance you need is simple. Just call 1-800-624-8888 or complete our free case evaluation form to schedule a free consultation with our team of motorcycle accident lawyers. There are never any legal fees unless we secure motorcycle accident compensation for you. “I highly recommend this very qualified law firm. I am so appreciative to The Rothenberg Law Firm for helping me win a settlement beyond what I expecting in my accident case. They took the time to explain the process and constantly kept me informed. I highly recommend them should you ever find yourself needing a very qualified attorney."